Back from the 7th Annual Blues Festival in Playa Potrero Costa Rica! Company is all gone and I am back in my office, so time to catch you all up. We attended the blues festival event for the 2nd year in a row. This time we traveled with a group of 7 people. 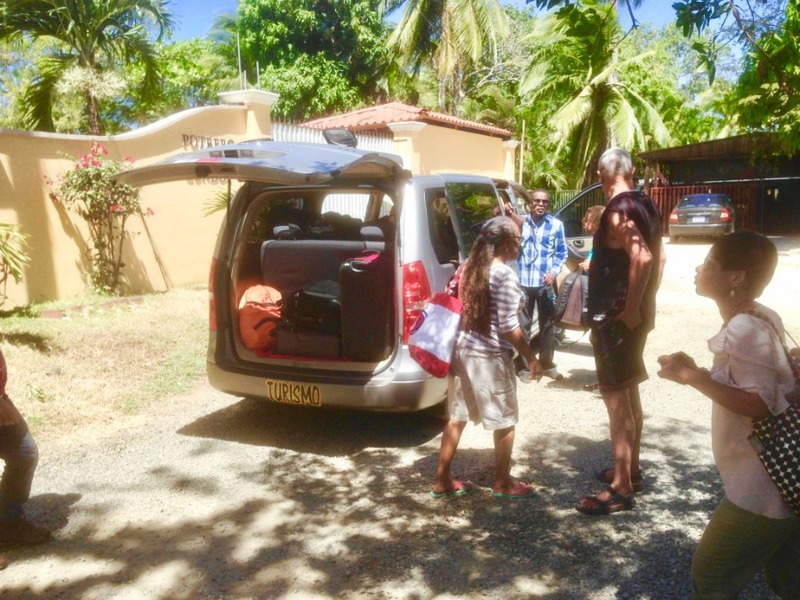 We rented a 3 bedroom, 2 bath condo in Playa Potrero, right on the beach (and it was only a short 10 minute walk up the beach to the Costa Rica Sailing Center - where the festival was held). We rented the condo through VRBO (it was also listed on AirBnb). I spoke directly with the owners, who just happen to live in Pleasanton CA - very close to an old apt that I once rented. The owners were very nice and the condo sounded like the perfect choice for us. The condo cost us about $900 for the 3 days, so we divided the cost up per bedroom. (if you want to stay there - which we may do again - the price is MUCH cheaper when there isn't a big event going on). We also hired a driver, Adrian, who we have traveled with before. He charged us $248 each way (which we divided equally among the 7 of us). The drive takes about 3 hours. Just about EVERYONE that I speak with wants to live on the beach in Costa Rica! The beaches here are very beautiful and there are about 300 of them along 800 miles of Costa Rica coastline. The country is surrounded by water on both sides. This is our 5th beach excursion. 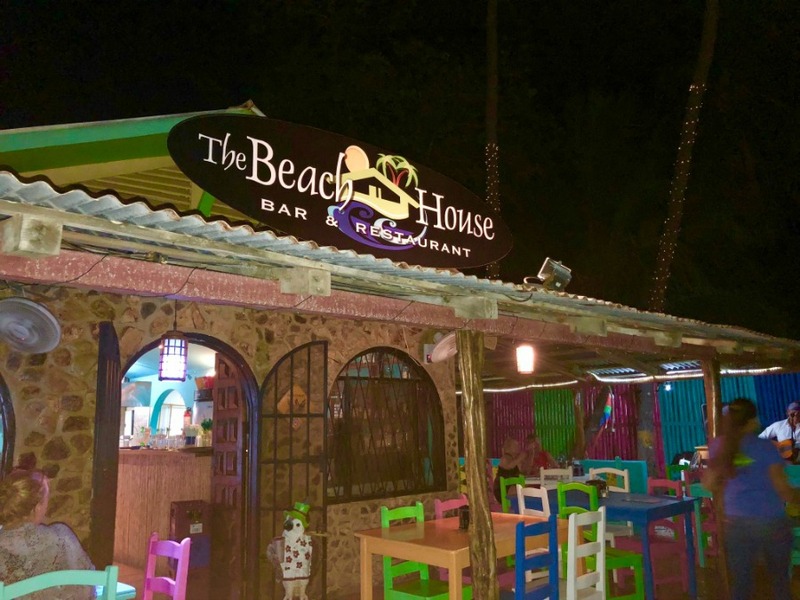 Playa Potrero is nestled next to Playa Flamingo in the quiet fishing village of Potrero. Playa Potrero is tranquil and serene. This beach is located along the northwest Pacific coast of Guanacaste, surrounded by rolling hills, tropical vegetation and a diverse wildlife. There are gorgeous turquoise waters that stretch over the white sand beaches. This beach community is ideal for watching the sun set in all its glory. If you want to get away from all the hustle and bustle of modern life, Playa Potrero is the the perfect destination! located on the beach near our condo. we had dinner here the 1st night we arrived. I like the Potrero area a lot. The weather in Playa Potrero is pretty comfortable -- for a beach town (i.e a bit on the warm side for me but tolerable). The temperatures stay around the 80's and 90's during the day (cooler breezes in the evening). You will probably still need air conditioning (our condo came with air). If you want to consider living in the area (as with the other beach towns) be sure to factor in the cost of air conditioning -- Cha Ching! Generally speaking, beach towns are more expensive. 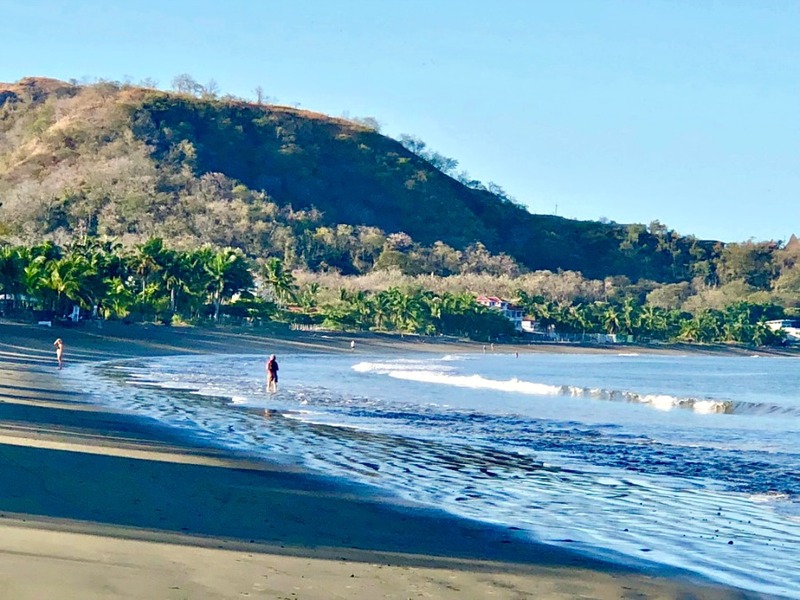 The Guanacaste region also receives less rain than other parts of Costa Rica, which makes the scenery a bit dry, dusty and desert like and IMO not as pretty as it is here in the lush, green Central Valley -- but the beaches are gorgeous. Their dry season spans from November to April. It was much cooler in Potrero than it was in one of my other favorite nearby popular beach towns of Playas del Coco (about 45 minutes away by car). 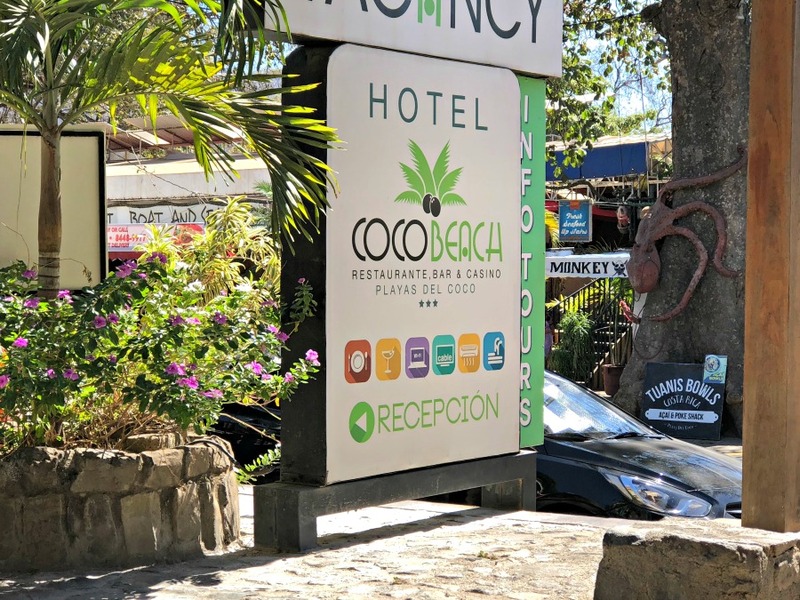 Coco is a more "happening" and touristy and has just about everything you can think of - even a Hard Rock Cafe - so that tells you something! And...We were not alone on this trip. We enjoyed the company of about 35+ other retired expats who drove up from our little town of Grecia for the blues festival. 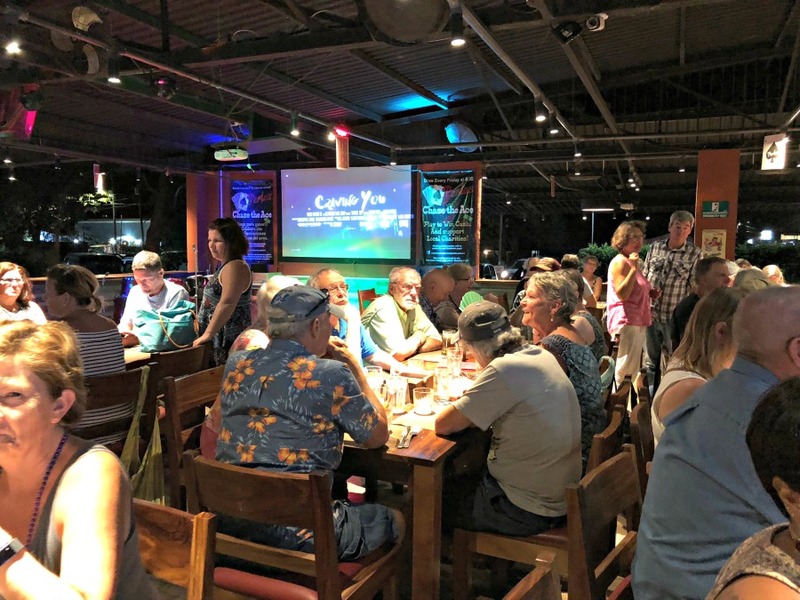 We met up for dinner on Friday at Perla's. During the blues festival the little town of Playa Potrero is totally packed. No vacant rooms available and the restaurants are so full that they often run out of certain foods due to the huge crowds! I have included a video below with more pictures of our stay @ Playa Potrero, the blues festival and music from the festival. Annika Chambers, an award winning blues singer from Houston was the headliner of the show and came on stage about 10pm. The festival goes from 11am to 11pm so it is a very long day. I have also used some of the music from the festival as background music on the video. Hope you enjoy it! One of our friends, Steve, was sitting in a chair minding his own business, enjoying the music and drinking a bottle of beer, when all of a sudden...the leg broke on the chair! He went down backwards hitting his head pretty hard on the corner of the table. OUCH! After investigation by the doc, it was determined that he needed a couple of stitches. No worries though. There was a medical tent set up right behind us. Stitches were administered by the light of a few cell phones! He is fine now. Life is a Beach! from Devon on Vimeo.